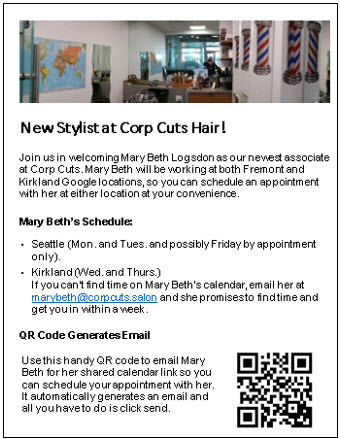 I recently had a need to create a QR code for a client who wanted a code to automatically create an email with content to send to a hair stylist at Google to request a hair appointment. I knew about them but had never created one before so I thought I would write about it as I did it and share my experience with others. QR Codes, or Quick Response Codes, are a type of smart bar code. A bar code is basically a machine-readable optical label that contains information about the item it is attached to. QR Codes do much more and have been around since the early ‘90’s. They were first used in Japan’s automotive industry. The cool thing about QR Codes is that when read by QRC reader software located on your smart phone, they will cause an action to happen. Traditionally, they were usually used to direct people to a web site. But from its rudimentary early beginnings, its capabilities have increased to the point where it can also send emails, direct users to YouTube videos, send a PDF file, download an app from the App Store, and more. In the past, QR Codes were found in magazines, on web sites, on airline tickets, or on other forms of advertising. But because they can store more data now, including geo coordinates, URL links, text, and more, you can expect to see them on T-Shirts, in books, hats, coffee cups, and pretty much anything you can imagine. Figure 1: Examples of some ways QR Codes can be used. Another feature offered by QR code software are analytics. 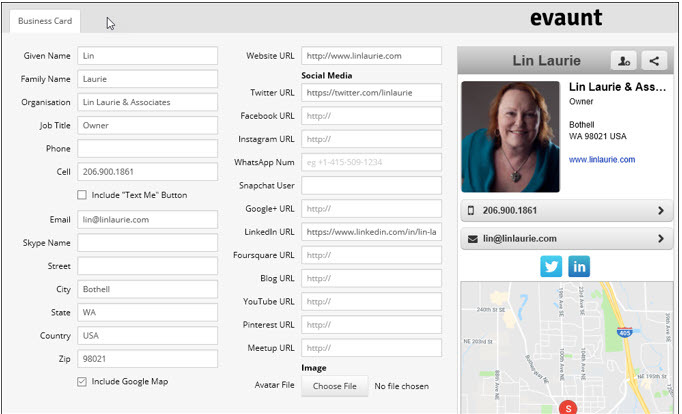 You can track the effectiveness of you add campaigns, call-to-action messages, web site activity, and more. You can find sites that will let you generate QR codes for free, but you must pay for an account that provides metrics. 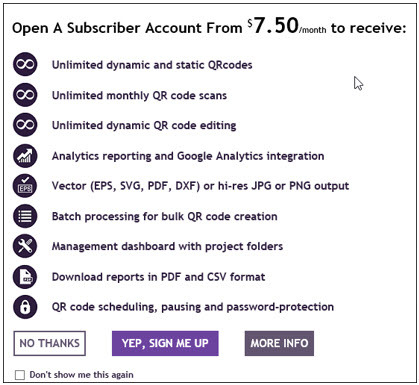 To see an example of the types of analytical information available from www.qrstuff.com, go to https://www.qrstuff.com/images/analytics-global.pdf. You can also use Google analytics with this software. For my project, we didn’t care about tracking the effectivity of the code so we chose a free site, https://www.qrstuff.com/, to generate our code. I looked at some other sites and they wanted you to enter into a 30-day trial, whereas this site just let you generate the code with no requirements to enter any details about yourself. Another nice thing about this site is that they make it really simple to create your codes. Follow the numbers on the front page to create your code. Select the data type from a long list. 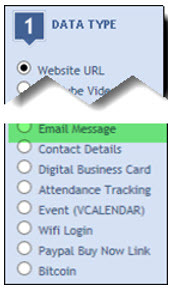 I selected Email Message for my project, but you can see from the graphic that there is a very long list of data types that you can select. Enter data into the fields in the Content section of the QR Code screen. Note: I chose purple as an example to show you what the code would look like if you selected a different foreground color. However, for my project, I used black, the default color. The reason for my choice has to do with contrast. Black, on a white surface provides the most contract, therefore is the easiest for QR Code reader software to recognize. The lighter your color choice, the more difficult it will be for the reader to recognize and perform the coded actions. 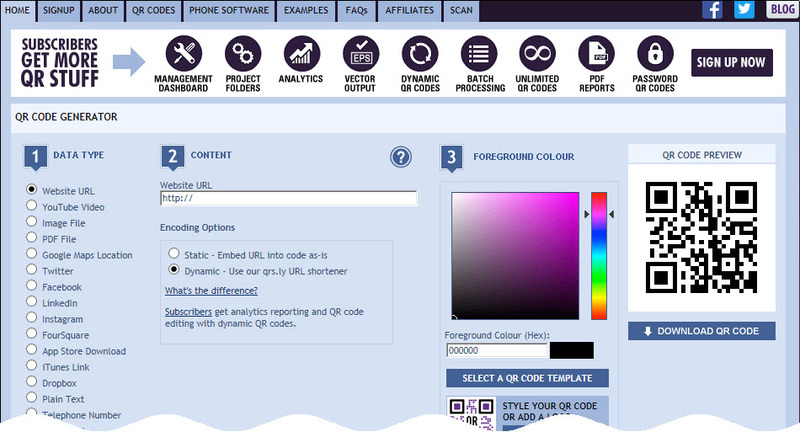 After selecting your color, you can click the Download QR Button below the Preview window, or move down to Step 4, Output Type (see image below) and select a different output Type before downloading your code. Click No Thanks to generate a free code. When you receive this download message, click Save, and then place the image in a document or email. 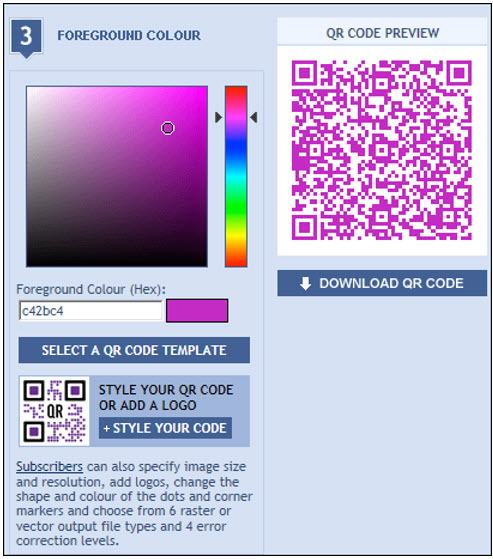 Use your own QR Code reader on your cell phone to test your code. The example above is a copy of what is generated after the QR Code is generated. 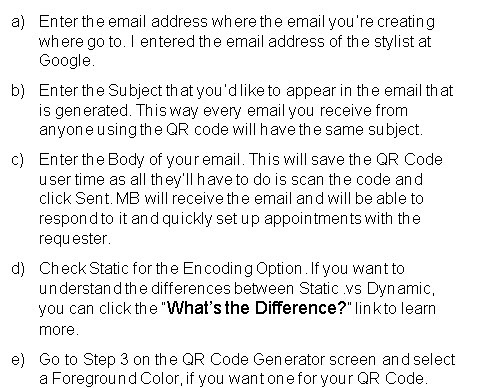 I had to send it to my own email account to be able to be able to take a screen shot of it because it is generated on a smartphone and sent to the person you listed when you generated the QR Code. After generating the code for my client, I decided to browse some of the other more notable Data Type options. Many of them require paid subscriptions. This makes sense for some of them, like the image file and the PDF because they require storage of the files on the site’s server. Facebook – You can choose to link to a Facebook page or create a Facebook Like. I think this is an awesome way to quickly get people to Like your page and I can see using this myself to generate more activity on my own business Facebook page. LinkedIn – You can share either a LinkedIn Profile or select a LinkedIn Share. App Store Download – This option will direct users to the App Store link that matches their smartphone type. You have to add links to every App Store where your app is available so there is a little setup work involved, but this is a very cool way to help people get your app quickly and easily. Telephone Number – If you want to get cute, you can use this option to quickly pass your phone number onto people you want to connect to. So, I can see a social and a business reason for this option. Try it and have some fun with it. You could put it on a web site, Facebook page, Instagram site, or other social media that accepts graphics and see what happens. SMS Message – I think this would be a great way to have people send a subscribe message to a cell number. The phone number needs to be cell number. Analytics aren’t available for this data type. But I’ve seen this used at sales events when people want to quickly connect with potential customers. They are able to grab the customer name and cell info using a QR code. There are also expensive software apps that do pretty much the same thing, so you can implement this and save a bunch of money. Contact Details – Use this data type to send a vCard or meCard (a data file in QR Code format) containing your contact details. 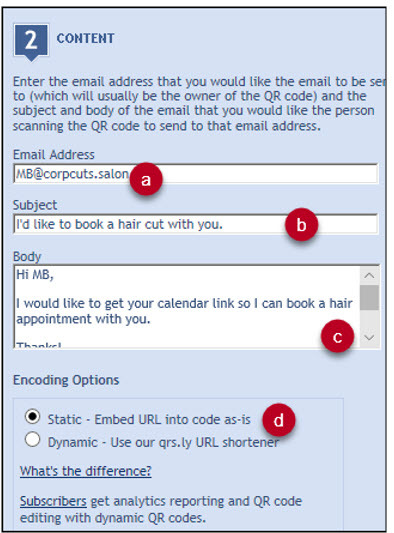 Figure 2: The information needed to create a Digital Contact. And here is the completed QR Code. 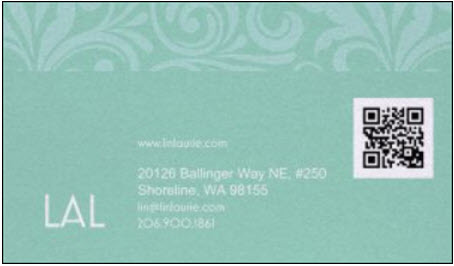 What it actually does is send a link (http://qrs.ly/l17k8i5) that will bring up the digital contact as a web page. I liked the entire process so much that I ordered new business cards with the QR Code on the back as you can see from the image below. And I’ve got it up and ready to share when I go to business meetings. I’m trying it out to see if it works to share the QR code or the business card. 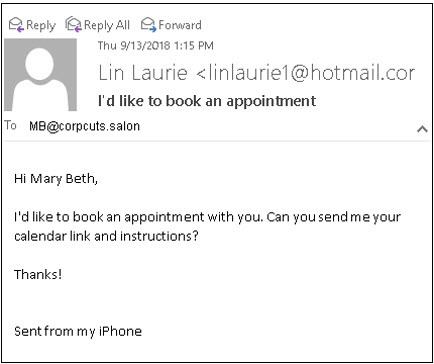 Once you open the image link in your phone’s browser, you can click the button next to the contact’s name and an application called evaut.me will open in a new browser window. From there you can add the .vcf to your contacts file. You can also click the more option to choose a number of options, such as sending it in a text message, an email, AirDrop, add to Notes, copy to Zoom (if you have the Zoom app), and many more options. QR Codes are easy to create and generate. I encourage you to get a QR Code reader for your smart phone, and then try using the software. Maybe you will find ways to use QR Codes for yourself or for your company. For more information on Androids and QR Codes, check out my other blog posts.